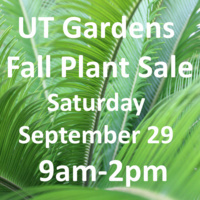 The public sale will be held from 9am - 2pm on Saturday, September 29th at the UT Gardens in Knoxville. Garden members can shop the preview sale on Friday, September 28 from 4 - 7pm. Memberships may be purchased or renewed during the preview sale or the public sale. In addition to having an early shopping opportunity, garden members receive 10% off their plant sale purchases during the preview or the public sale.